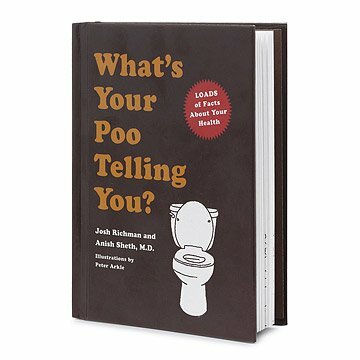 In this entertaining guide, this book explores the workings of the human body to reveal the truth about poo. After reading this book, you'll never see poo the same way again (but you'll probably look at it more closely). Potty humor aside, bowel movements can provide insight into our health and well-being. And once you get over the fact that you are reading a book about Number Twos, you'll realize that you didn't know s*** about your body! Features straightforward and very, very funny descriptions and illustrations about every kind of bowel movement you ever or could possibly have. With notes from "Dr. Stool," trivia, case histories, hilarious synonyms and other interesting "nuggets," this book will be a welcome addition to any bathroom library. Manufactured in Canada. Funny book for the bathroom. Just a small, quirky, witty addition to the bathroom. Has provided lots of giggles, laughs and comments. Great book. Entertaining and educating. I gave this as a gift and it was a hit. Unfortunately, I had to hear the tales of the end results. #sweepstakes. I gave this to my daughter as a stocking stuffer. She's always been inquisitive about what her poop shape, color meant. While it is a great funny gift, it was also informative- she loved it. Never will leave the bathroom again without this gem! Great for someone in medical/nursing field! Great gift for the perfect person!